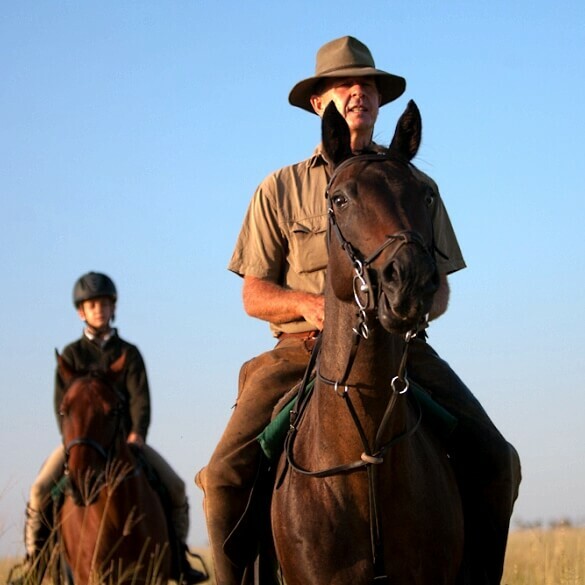 Experience the bushveld on horseback with the exceptional top guides profiled below to ensure your trip is the best it can possibly be, because the guide has a huge impact on the quality of your ride. 1992 TO PRESENT: Waterberg South Africa horseback guide. 1987 TO 1992: Daintree National Park Australia. 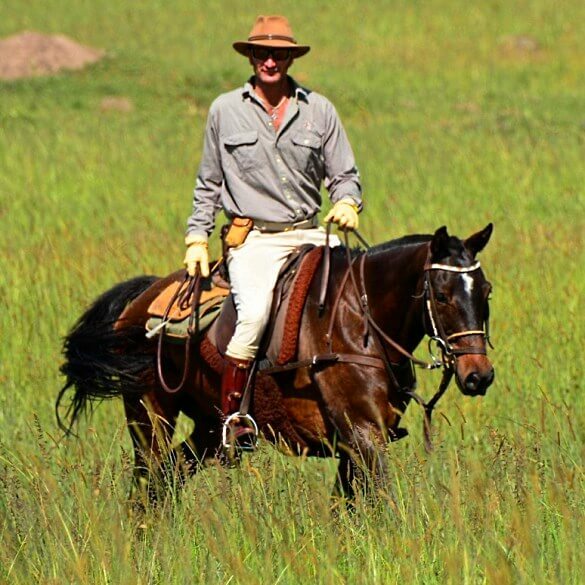 I started guiding in the Daintree National Park on horseback of Far North Queensland in 1987. They had a particularly good ride there through pristine rainforest, and once I had done it I was hooked on horses and the bush. 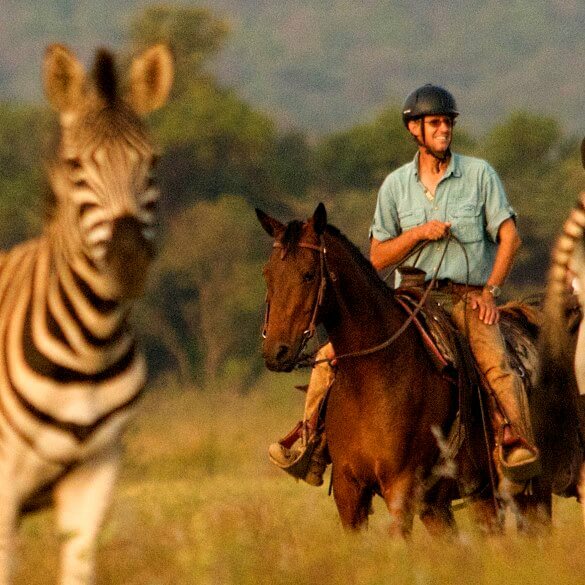 WHAT MAKES A GOOD SOUTH AFRICA HORSEBACK SAFARI GUIDE? 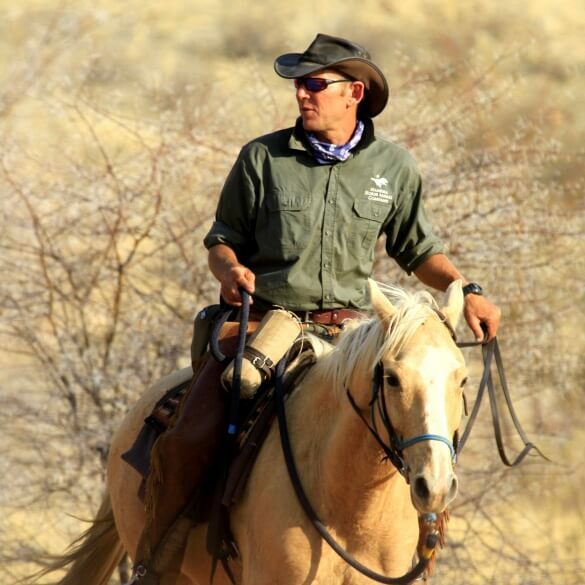 Someone who matches the enjoyment of horses with a passion for the bush and someone who is able to lead a group of people safely in a wilderness setting on an adventure of exploration. Taking a tumble in front of guests. Elephant. Beautiful, fascinating, with a touch of scary thrown in. That said, I love Impalas, the underrated rentacrowd of the bush. Having a Jackal running alongside my ride barking at my dogs. Spotting a sub adult Giant Eagle Owl just standing on the ground. Walking over to it and being able to touch it before it flew away. 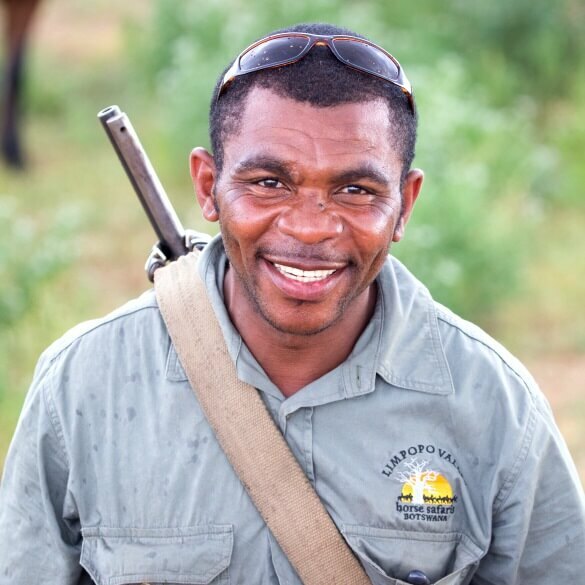 1998 TO PRESENT:Had the privilege of becoming a founding member of the Karongwe Game Reserve. 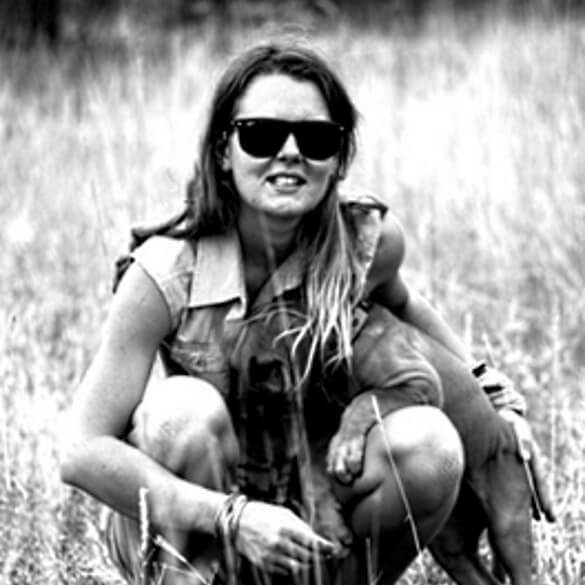 1997 TO 1998:Started as a volunteer at a family owned big 5 reserve in the Hoedspruit area. As a little boy back in Germany I was dreaming to be a mounted ranger and patrol the wildernesses of our planet from the back of your trusty horse. Got the Africa virus in 1992 and made the move together with my wife in 1998. 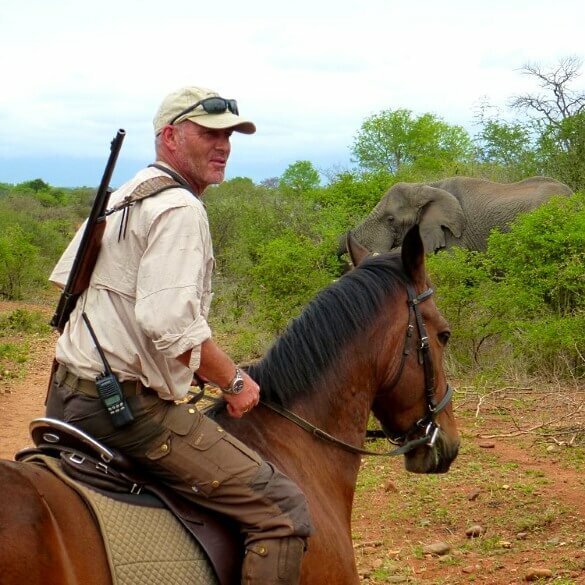 Doing safaris on horseback was what we both wanted right from the start. It gives me the kick to this day. 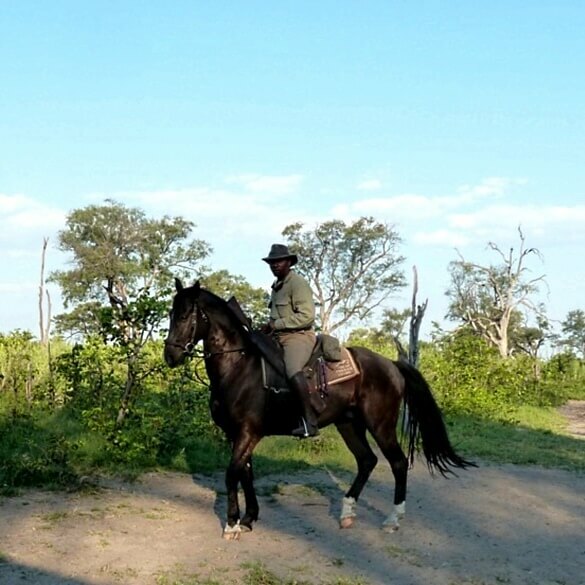 To get on your horse and move out into the bush not knowing what might be around is still the best thing to experience. Passion and being able to move the riding guests with laughter and excitement. To be able to make people trust you as the guide and feel safe at all times but at the same time make it look easy. To be adventurous but not as a show off cowboy. The Rhinoceros, as I see it as the most innocent behemoth on the planet. To be able to watch such a peace-loving creature at two and a half tons is still leaving me with a smile on my face twenty years later. This is for Black and White Rhinoceros alike. The Black one is just a bit more nuts. Back in 1999 the elephants in our area where reintroduced from KwaZulu and the young cows had their first calves here with us. The first two years they tend to be quite aggressive and used to charge horses and Land Rovers readily. It was really hard work for my lead horse Nina at the time to keep her nerves and not leave me alone in the ….! One morning a new calf was born the night before and the most silly cow as usual started to get angry with the horses presence and came through the herd to charge us. All of a sudden the matriarch with her big attitude and vampire tusks screams at her and with a rumble moves backwards into her pushing her back. What followed was a mexican standoff for another half an hour and we all went our way. The breeding herd has never charged at me and my horse again ever since! Left me speechless.